Net netrality isn’t just something to keep politicians yapping at one another. It could have a real affect in your online life. If you use the internet, you should care about net neutrality. Almost half of the world’s population goes online on any given day, but how many give a thought to whether their Internet Service Provider (ISP) is doing all it can to fairly deliver fast, reliable connections? Most people blindly trust their ISP to enable them to surf wherever they want, whenever they want. However, providers aren’t always prepared to deliver as they should. The temptation to skew access so that it favors them and their affiliates is too great. This is why net neutrality is so critical. Exactly what is net neutrality? It’s been in the news in recent months as the Trump administration’s FCC has rolled back the net neutrality policies that were enacted by the prior administration. While some people think that these policies can’t affect them, the reality is that not having net neutrality laws in place means that ISPs are empowered to control what customers view. If that sounds a little scary, keep reading. 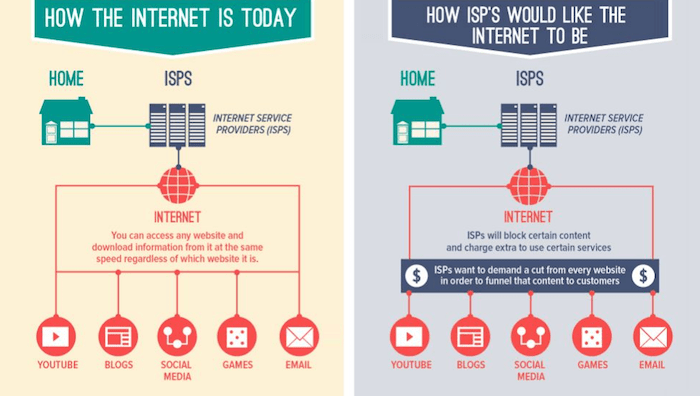 Essentially, net neutrality is the concept that Internet service providers should not favor certain content over other content, which means that they should occupy a neutral position as they transfer data across their network. In this neutral network, all content gets equal treatment and has equal access to network resources. 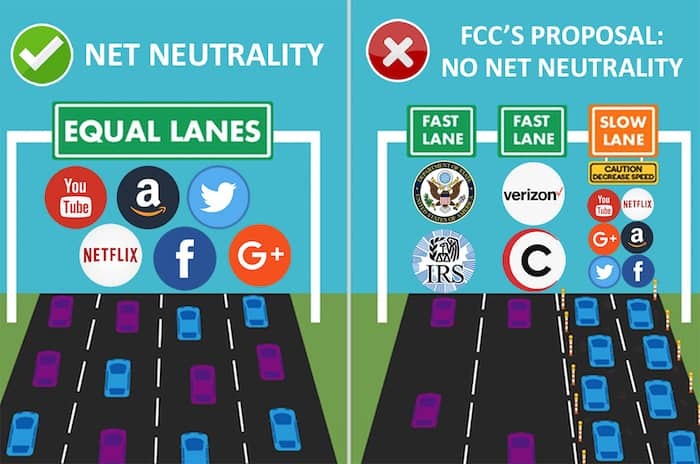 Net neutrality also means that ISPs should be prohibited from creating “fast lanes” for some data while putting blocks up against other data that comes from a competitor or that takes a perspective with which they do not agree. As an example, your ISP should not be able to throttle your connection to Netflix in an attempt to get you to sign up for their proprietary streaming service. The idea of net neutrality is aimed at keeping the Internet an open, level playing field. It means that all companies, large and small, have a chance at succeeding online. If net neutrality policies are not in place, then large companies have a distinct advantage. They could pay to have their data put on the “fast lane,” leaving their competitors to struggle for bandwidth. Imagine if video streaming, which was a new technology at the time, had been blocked by ISPs in the early 2000s. Popular streaming services that are well-known today may never have had a chance to get established if the concept of net neutrality didn’t exist. Telecommunications companies provide high-speed Internet access across the US. Only a handful of companies offer this service. Among them are Verizon, CenturyLink, AT&T, Charter, Cox and Comcast. In some locations, people only have a couple of options from which to choose, and some regions have only one provider. When customers go online via one of these broadband providers, they expect the company to transmit data along the network to and from their computer. Ideally, this transmission occurs without manipulation or interference on the part of the broadband provider. With net neutrality policies having been rolled back in December 2017, the Internet Service Providers all promised to play fair. Nonetheless, the possibility exists that the companies that provide broadband services may decide to choose favorites and offer “fast lanes” to certain companies that are willing to pay the price. Advocates for net neutrality argue that this will happen sooner rather than later and that this practice may signal an end to fair online competition. Using a VPN won’t mitigate this issue either. Broadband Providers Wouldn’t Really Tamper with Data, Would They? Also in 2007, Verizon blocked members of pro-choice group NARAL from using a text-messaging program. The company said that they did not want to provide services to anyone “that seeks to promote an agenda or distribute content that, in its discretion, may be seen as controversial or unsavory to any of our users.” Later, the company was forced to lift its censorship in response to an outcry from the public. 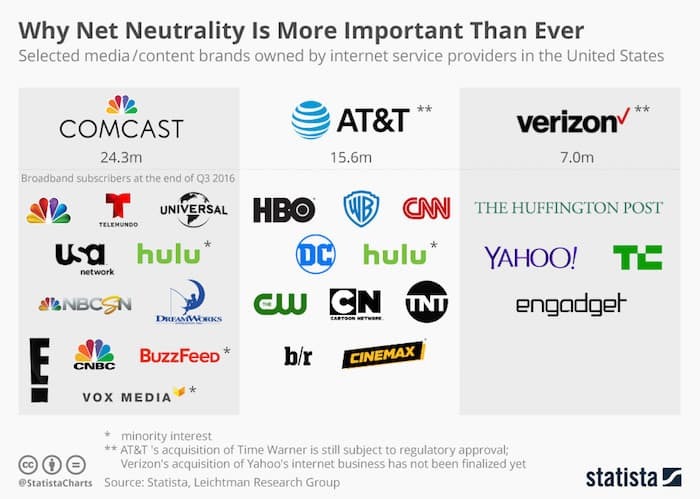 Once you start looking into net neutrality, you’ll hear the term “common carriers” tossed around regularly. The concept of a common carrier actually dates back to ancient Rome. It was recognized at that early time that certain services and businesses were so critical to the functioning of a nation and an economy that laws needed to be passed to ensure that everyone had equal access. Under this concept, these businesses or service providers served the citizenry at large rather than choosing their customers. Legal benefits were bestowed on these providers as a reward. They might be granted access to public property. This was the case with the railroads in America. From virtually their earliest days, railroads were treated as common carriers, which made it possible for the companies to lay track on public lands. Telephone providers similarly enjoy common carrier status. This gives them many benefits, but they must be neutral in exchange. For instance, Verizon cannot opt to drop calls or deliberately provide poor call quality when its customers call Little Caesars because they have been paid to do so by Domino’s. Imagine how infuriating it would be if your cell phone company could accordingly dictate which pizza you chose to order. The Communications Act of 1934, which was signed into law by President Franklin D. Roosevelt, established the Federal Communications Commission, or FCC and empowered it to regulate new technologies like the burgeoning telephone networks and broadcast television. Within the Great Depression-era law also was the establishment of certain Titles that still govern entities in the communications field. As an example, Title II defines common carriers. The FCC had the ability to designate a communications business as a common carrier. Historians note that the 1934 law was a reaction to the more laissez-faire policies that had prevailed in the 1920s. Those policies included an extreme lack of regulation. Monopolies sprang up, and wealth was consolidated in just a few isolated areas. The Communications Act of 1934 was part of the New Deal, which was a larger effort to rein in corporate power. Specifically, the law was meant to take on The Bell System, which remains one of the most powerful and influential companies in American history. The Bell System eventually became AT&T, which is still in existence. During the Depression, AT&T held a massive monopoly in the telecommunications market, but the law was not meant to break up the monopoly. The focus was instead on ensuring the neutrality of the services offered by the company. This meant that AT&T was subject to regulation of the rates they asked users to pay. The government would have oversight to determine that all users were paying the same price. Under the law, the telephone company could not change their fees or their level of service based on the identity of the customer making the call or the customer receiving the call. The content of the conversation was irrelevant. All data transfers over phone lines had to be treated equally. In a 2003 paper, Tim Wu, a Columbia University law professor, established the phrase “network neutrality.” Broadband providers were widely banning Internet users from using virtual private networks. Others were blocking customers from the use of WiFi routers. Professor Wu was concerned that this tendency toward restricting developing technology would hurt the future of innovation. Accordingly, he called for a set of anti-discrimination policies for the digital world. President George W. Bush’s FCC understood the issue and proceeded to craft a policy statement that forbid ISPs from blocking legal content that users tried to access. Moreover, the policy aimed to prohibit ISPs from dictating which devices customers could use to connect to the Internet. This policy was used as the basis of a 2008 FCC order to Comcast. The ISP was throttling connections for people who were using BitTorrent software (a common means of accessing the Dark Web), even when it was being used for legitimate purposes. The FCC insisted that Comcast cease the practice, but Comcast sued, saying that the FCC had reached beyond its authority. A decision by a federal court found in favor of Comcast. Little progress on net neutrality was made until 2010. Under President Obama, a more robust net neutrality policy was enacted. However, Verizon sued the FCC this time, and they prevailed. The court said that the FCC did not have the power to impose such neutrality regulations on companies that were not common carriers. This led the FCC to suggest in 2014 that broadband carriers should be classified as common carriers under Title II. Providers would not necessarily have restrictions that were as stringent as those required of telephone companies. Nonetheless, the change would mean that strong net neutrality policies would prevail in the US. Broadband providers were unhappy about the reclassification, leading them to sue the FCC yet again. However, the courts said that the FCC had the law on their side this time. Sweeping net neutrality policies went into effect across the country. A presidential election in late 2016 brought a new administration into the White House in early 2017. By the end of the year, new FCC Commission Ajit Pai had succeeded in his plan to entirely reverse the net neutrality order that had been put in place in 2015. Internet Service Providers were no longer classified as common carriers, and there were no longer any restrictions in place that would bar these companies from throttling or outright blocking any content. Responsibility for protecting consumers for violations of net neutrality infractions now falls to the Federal Trade Commission. However, this agency cannot make new rules. It can only enforce them. The upshot is that any alleged net neutrality violation must also be an illegal activity as defined under fair-competition laws. If an ISP blocks a competitor, then it may be pursued under antitrust laws, but making it possible for companies to pay extra fees for being given a “fast lane” would not be a violation. Several US states have passed their own net neutrality regulations in the aftermath of the repeal of the federal rules. Washington was first, followed closely by Oregon, Hawaii, New York, Vermont, Montana and New Jersey. Broadband providers are already promising to fight these policies at the state level. Still, members of the US Congress are proposing new legislation that would provide countrywide net neutrality policies. 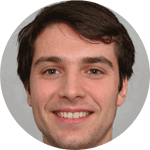 Some of the proposals would simply reinstate the 2015 regulations while others would make fairly substantial changes to those policies. Observers expect the broadband companies to slowly and covertly begin to take advantage of the freedom that the repeal of the net neutrality rules has given them. These changes are unlikely to be huge or abrupt, particularly while states and the federal government are still wrangling over possible net neutrality policies. One subtle way that companies may take advantage is by allowing content that they or an affiliate produces bypass any data limits. As an example, people who have AT&T as an ISP and watch the affiliated DirecTV Now streaming service can watch as much as they like without it counting against their data limits. However, watching another streaming service, like Netflix, will take a huge chunk out of available data. With big business and government still fighting over the need for net neutrality laws, it seems that this situation is far from a resolution. 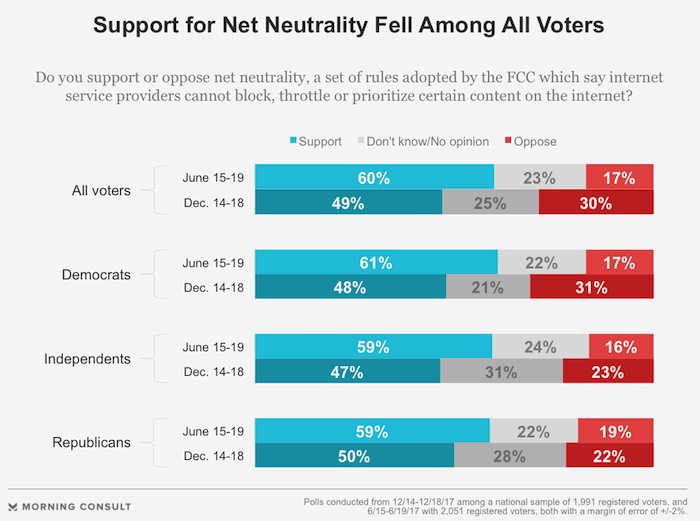 Consumers may take action by informing their representatives of their support of net neutrality regulations.